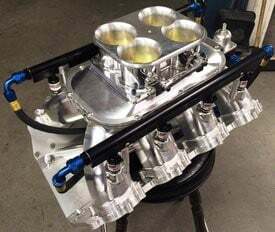 Sonny's Billet aluminum Single 4 Barrel manifold for Sonny's Hemispherical Headed Engines. Available for various deck height applications - features fully CNC'd 5 manifold. Available for carb or EFI application. Works great for top sportsman and top dragster applications. Call for Pricing.